People have always played. In any way and with anything. Ancient findings prove that people did not only just play thousands of years ago but that board games and playing were part of the culture(s) at that time. In most cases, only the game materials of this early evidence of game and playing culture have come down to us, rarely the corresponding rules and, almost never, the inventor(s) of the game. Only a few exceptions prove the rule. In the early modern period, Thomas Murner (1475-1537), Georg Philipp Harsdörffer (1607-1658) and Christoph Weickmann (1617-1681), among others, were known by name as inventors of parlor games, educational card games or board games. Also the Filosofia Cortesana by De Alonso De Barros (1587) belongs to them (see figure). The card game Cribbage (early 17th century) is attributed to the English poet Sir John Suckling; other sources name Sir Richard Swiveller. But until not too long ago, the names of most designers – although games had already become commodities and cultural assets – were not known. Chess, nine men's morris, checkers, backgammon, dominoes, ladder games – and also Pachisi (known mainly as Ludo or Mensch-ärgere-Dich-nicht) are a few examples. In the late 19th century, individual game designers as originators of games could be verified for the first time, even though they were only rarely mentioned on or inside the game box. Widely unknown is the inventor of Halma, the American surgeon George Howard Monks (1883). The best-known example is Monopoly and its forerunners: in 1904, The Landlord's Game by Elizabeth Maggie got its first patent; later, Charles Darrow promoted the modified folk game and self-published the first edition under the title Monopoly in 1933. Read more under The secret history of Monopoly. 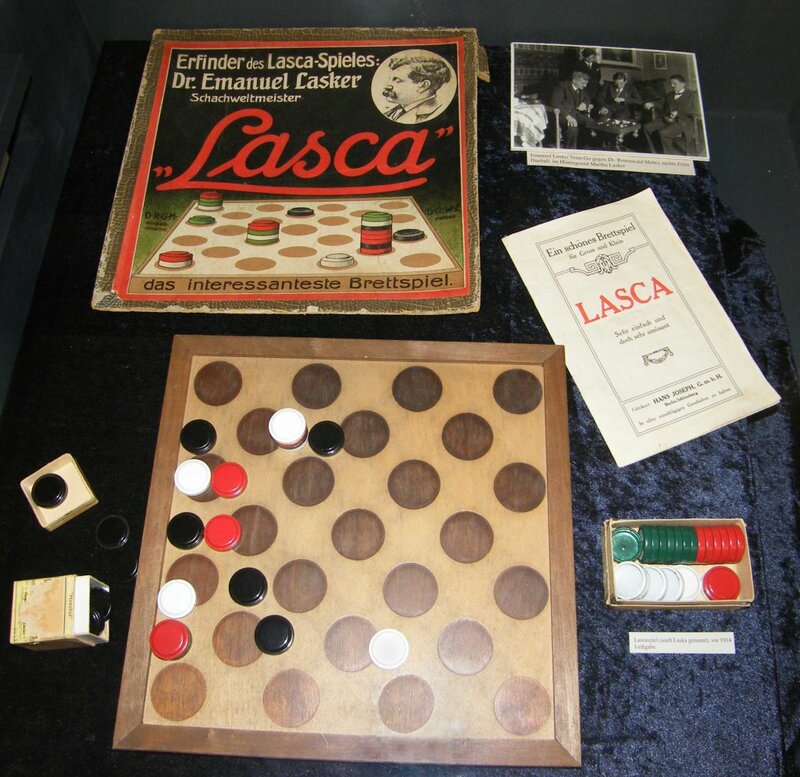 The game Lasca by the chess world champion Emanuel Lasker belongs to the same time period. His checkers variant was already released in 1911, mentioning the prominent name because of the designer's fame! An article from the German Spielbox 5/2006 offers even more details on this topic. Decades later, in the 1960s and 1970s, when the so-called Bookshelf Games became popular, in particular by 3M, other companies, such as Ravensburger and F.X. Schmid, also went along with this. This way, grand old masters like Sid Sackson and his Aquire and Alex Randolph and his Twixt became well-known among players. The package design, with a look similar to books, were grounds for the assumption that it would be a matter of course to mention the designer's name – which, unfortunately, it wasn't, at least with 3M. "None of us gives a game to a company if our name is not written on the box cover!" Among the signatories were, besides Reinhold Wittig, Helge Andersen, Hajo Bücken, Erwin Glonegger, Dirk Hanneforth, Knut Michael Wolf, Wolfgang Kramer, Joe Nikisch, Gilbert Obermeier, Alex Randolph, Johann Rüttinger, Roland Siegers and Ilse Dreher-Plonka. In the meantime, we can point out on a positive note that more and more publishers started to name the authors not only on the cover, but also present the authors with picture and a short text in the game rules or on the back of the box. For some publishers, there are search engines on their websites where you can view their games. Keep it up!